The male Yellowthroat has a distinctive black mask. The doctor’s new patient information form I was required to fill out included three questions I had not encountered before. They wanted to know my “color,” “ethnicity,” and my “country of origin.” “Color” was easy: I was “sun-tanned with various bruise splotches” caused by the blood thinning medications I take. I was not sure what they were asking for in “ethnicity,” so I checked the definition and found “…belonging to a social group…with common cultural tradition.” OK, I am an environmentalist, belonging to a number of environmental organizations, so “environmentalist” went down on the form. While in the midst of this questionnaire process I received a message that a friend had a Yellow-throated Warbler he was seeing regularly at his place. That made me wonder how color, ethnicity, and country of origin may have gone into the process of naming and identifying birds. Certainly color is a huge factor as a majority of birds are described by their color. Ethnicity probably is not as important in bird nomenclature, but country of origin and even state location has played a role in bird names. The popular birding app, iBird Pro, has 19 species with the modifier “American” in front of it; 13 with either “European” or “Eurasian” as part of the name; and a great many “Eastern” and “Western” species. But the champion bird name modifier is simply “Common,” with 30 species bearing this less than descriptive manner of helping birders to identify different species. Among the warblers there are two species described as yellowthroats: the Common Yellow-throat and the Yellow-throated Warbler. Both do indeed have yellow throats, but that is where any similarity ends. Yellow-throated Warblers are basically gray and white with black streaks and the only yellow on the bird is on its throat. (left) They are slightly larger and chunkier than most warblers and have larger bills than most warblers. Males and females have pretty much the same plumage, and young look like the adults from the beginning. They prefer pines, sycamores and large trees with open under-story and can be found in south Florida in the winter. 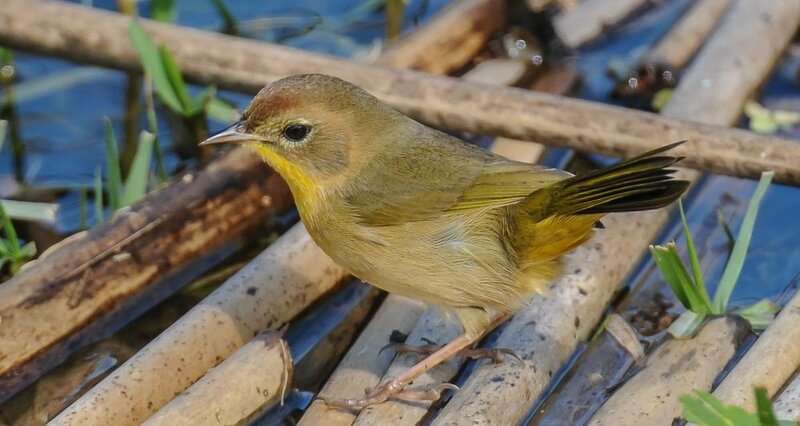 Conversely, the Common Yellowthroat is primarily an olive colored warbler with extensive yellow extending from the throat down onto the underbelly and again under the tail. The male has a black mask (top) which differentiates it from the female’s more plain plumage. (right) Young males develop their black mask after their first year, but it may look quite scraggly until it fully develops. (below, left) Common is an apt description for the species as they are indeed ubiquitous, found in a great variety of habitats throughout most of North America, and year round in south Florida. They are skulkers and sometimes can be frustrating to see as they move through thick close to the ground vegetation. After the doctor saw my new patient form and stopped laughing at my answers, she said “color” – white, “ethnicity” – American, and “country of origin” – USA, would have been all I needed. Still, it seems to me that these categories applied to birds could be a relevant topic for considerable research. Think about it, every spring millions, if not billions of migrants invade our shores and great land from all over South and Central America, from many different “countries of origin,” and we don’t question their motives at all, except that we know they want a better life here each summer. And Lord only knows what their “ethnicity” might be! Fortunately, we are well able to see their “color,” and thankfully, that aspect is a very fulfilling part of our birding sport. Now if we could only get them to fill out a questionnaire we would have it made.